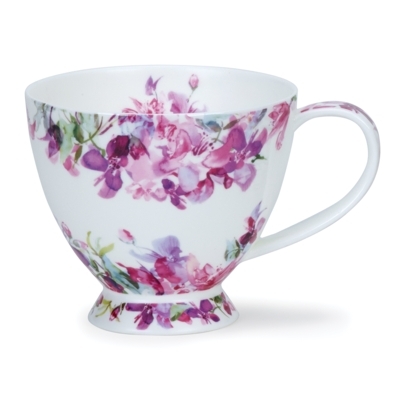 Skye is a large, on-trend, teacup style shape. It holds 0.42l and has a comfortable strap handle. It lends itself to modern and unique designs and is very much a statement piece. 'Fiore' is a fabulous floral design by Harrison Ripley, with a crisp, white background fringed with masses of pretty pink and purple blooms.